They've shown that they've got depth. They've got the strength. They've got the determination. Now, the Timberwolves have a championship to show for it. The Tualatin High School wrestling team captured the team title at the Don York Invitational, held Friday and Saturday at Cleveland High School. The Wolves took first place at the 21-school event with a score of 330 points. Centennial was second with a score of 309.5 and St. Helens was third at 186. In addition to winning the team title, Tualatin also had three wrestlers win individual championships at the event. Tualatin senior Argenys Arbarca-Lopez took first place in the 113-pound weight class. After receiving a first-round bye, Arbarca-Lopez pinned Miles Lee from Hood River Valley in a time of 45 seconds in a second-round match. In the quarterfinals, Arbarca-Lopez pinned Benson's Simeon Braun in 0:58. Arbarca-Lopez then picked up another win by fall in the semifinals, as he bested Centennial's Jake Angelovic in 5:15. Arbarca-Lopez then picked up his fourth pin of the tournament, beating McNary's Grady Burrows in 4:21 in the 113-pound championship bout. Tualatin senior Justin DiCola picked up a tourney title at 195 pounds. DiCola opened the tourney by pinning Sunset's Devon Roberts in 1:11 in a first-round match. DiCola then got a 17-2 technical fall win against Lincoln's Jackson Jones in a second-round match. In the quarterfinals, DiCola got another technical fall win, this time beating Forest Grove's Kyle Daily 18-2. In the semifinals, DiCola posted a 15-7 major decision win against Franklin's Gabe Mortensen. Then, in the 195-pound title match, DiCola got a 5-4 decision win over J.R. Scott from The Dalles. Tualatin senior Gavin Moore captured tournament gold at 285 pounds. Moore, after receiving a first-round bye, needed just 27 seconds to pin St. Helens' Garrett Cook in a second-round match. In the quarterfinals, Moore pinned Sunset's Gustavo Mendez in 3:08. Moore then defeated Centennial's Randall Sheck by fall in 4:33 in the semifinals. In the 285-pound championship match, Moore defeated Liberty's Rafael Hinojosa 4-1 in a tie-breaker. The Wolves almost had a fourth champion, as junior Jake Reser took second place at 160 pounds. Reser won his first four tourney matches, getting three of those victories by pin, before falling to Steven Preston of The Dalles in the championship match. 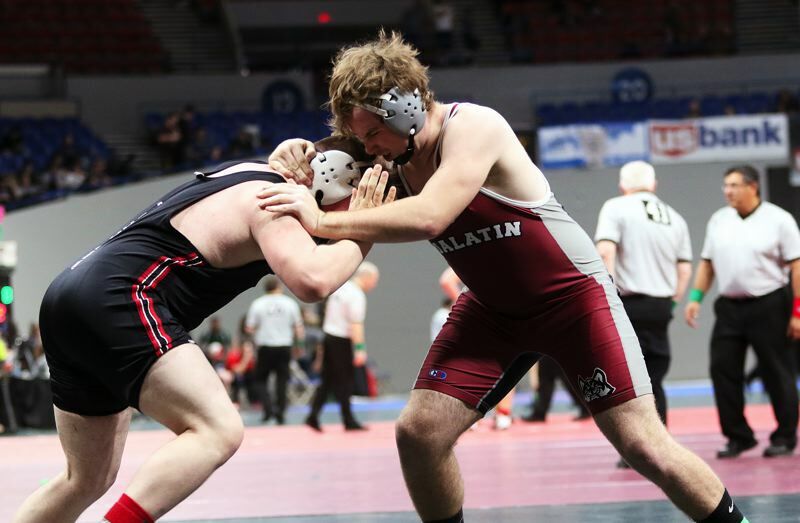 Also for Tualatin at the tournament, senior Dane Norlin placed third at 220, senior Christian Bostick was third at 170, junior Cody Van Meter was third at 182, senior Sami Victoriano was fourth at 132, sophomore Josiah Ingram was fifth at 132, senior Connor Lennehan was fifth at 138, senior Ismael Lopez-Barbosa was fifth at 220 and junior Noah Brooks was sixth at 145. The Wolves will be back in action on Thursday, when they host rival Tigard in a Three Rivers League dual match. Junior varsity bouts are set to start at 5:45 p.m., with varsity matches following at 7 p.m.